Day 1: Flew into Denver on Thursday evening. I spent the whole 4 ½ hour ride talking to a lovely couple from Cheyenne, Wyoming about this, that and the other thing. Colin and Becky are foster parents and have a total of 10 children – five birth children and five adopted. They are an amazing couple! I quickly made my way to Golden and got checked into my hotel for the night. Sunset was spectacular over the mountains. I am so glad to be out West again! Day 2: This morning I went up to Lookout Mountain to visit the grave of Buffalo Bill Cody. What a view! Snow capped mountains to the west, the foothills and prairie to the East. I walked through the small museum depicting his life and achievements. He was a real showman, and much of the way we think about the Wild West had its routes in his shows. Probably the most moving part for me was when the show went bankrupt and he was forced to sell his favorite horse that he loved so dearly and rode everywhere. Fortunately, a friend bought the horse for 150 dollars (a lot of money in those days), and promptly gave him back to Buffalo Bill as a gift. I spoke to a staff member in the gift shop and she told me they had a ghost in the old building – first built by Bill Cody’s adopted son shortly after his death. It throws things around, messes up the shirts, and other small pranks. Folks there think it’s the spirit of Buffalo Bill, who is buried just up the hill. 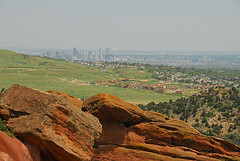 Next I drove down to Red Rocks and spent a couple of hours hiking amidst amazing scenery. The Rocks are enormous! One looked just like the Titanic as it upended itself prior to sinking. There was some kind of school outing taking place, and I kept meeting kids with their parents and chaperons all along the trail. It was fun! After the hike, I drove up to see the amphitheater, which is acoustically perfect because of the large red rocks behind the stage and on either side of the risers. What a place! My last stop of the day was the Butterfly Pavilion just north of Denver. I was tired out from my first hike at 8000 feet – not adjusted to the altitude - but I still enjoyed taking pictures of the lovely creatures. A fellow photographer showed me a few good spots to take photos, which was a bonus. For dinner that evening, I drove into Golden and marveled at the Wild West feel to the old town, sitting right in the shadow of Table Mountain. I found a great pizza joint that was enjoyed by all the locals and had a great meal before returning to my hotel amidst another spectacular sunset. Day 3: I was up early again today. Still haven’t gotten used to the altitude and the time change. Today was my drive to Estes Park, and I took the long way, through Clear Creek Canyon on Route 6, to Route 119 and up and up to the Peak to Peak highway ( Route 7) leading to Estes Park. Wonderful, scenic views along the way, and I stopped to take a hike at Lily Lake on the edge of the Rocky Mountain National Park. Then I drove down and down a winding road into Estes Park. Wow! The valley is surrounded by mountain peaks, and the Stanley Hotel – where I was staying and which was the inspiration for Steven Kings book “the Shining” - was easily visible when I entered the town. After a quick lunch, I took a tram to the top of one of the mountains and gaped at the magnificent view, taking many photos and hiking up toward the peak. 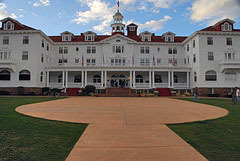 Then I hurried down to the valley and over to the Stanley Hotel to check in and take the ghost tour. The ghosts at the hotel all appear to be friendly. Our tour guide claimed to have heard the ghost of Mrs. Stanley playing classical music on her old piano just the previous week, and she had also seen several apparitions – one man walking in the billiards parlor and a woman walking into the wall of room 217 – where Steven King once stayed. It was also the room where – due to a gas leak – an explosion occurred in the hotel. Of great interest to me, on the tour, was the fact that one staircase and one hallway where supposed to be haunted by children. And the one person getting orbs in her photos was a little girl about 10 years of age. She kept complaining about “dust” appearing in her pictures. I asked if she would show me her camera, and immediately recognized the dust spots as ghostly orbs, which appeared near her both on the staircase and in the hall that were haunted by children! Interesting… Dinner that night was in the hotel restaurant. After enjoying a truly wonderful filet mignon, I withdrew to my own haunted guest house – where all the bachelors slept in the good old days – and had a good night’s sleep. If those bachelors were partying, none of them invited me to come along!! Day 4: I was up early again. Still not adjusted to the time change! However, it did allow me a chance to eat at a great local place called the Egg and I before embarking on an exploration of the Rocky Mountain National Park. The pass was closed on Trail Ridge Road, so I knew I’d have to turn around at the top. Still, I headed up as far as I could get – which was Rainbow Curve – and promptly hit a wall of traffic. After sitting for almost half an hour, a park ranger drove past me, and when I waved he stopped and told me they were opening the road! Hurrah! Worth the wait. 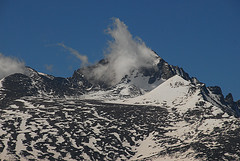 Soon I was climbing above the treeline into the tundra and the snow. Wow. Talk about spectacular views! Mountains everywhere. 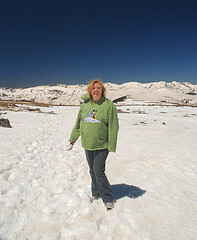 I stopped at Rock Gap to take a hike up to the peak through the snow and the ice. This was about 12,000 feet up and boy did I feel it. I panted all the way up, and was fine walking down. But I kept pouring water into me, to prevent altitude sickness. In spite of all this hydration, I still felt a little strange during the ride down the mountains, in part because of hiking in such cold circumstances – which added insult to injury considering how much trouble I was having adjusting to the altitude. Still, I recovered enough by the time I reached the end of the park to stop and photograph some elk grazing in the field, and as soon as I got out of the park, I pulled over to shoot pictures of a huge bull moose laying in the shade at the edge of the forest meadow. Cool! When I reached the town of Grand Lake, I saw white pelicans floating around in a big flock on the water. White pelicans plus snow capped mountains were an irresistible photography combination, so I didn’t resist! For the next two hours, I drove through incredible scenery along the Colorado River, heading toward Silverthorne. I kept puzzling over the mountains on either side of the road. One side could be full of evergreen trees, and the other full of scrubby sage bush! What in the world? A native Coloradoan told me later that this was due to the amount of rainfall each side got. Apparently, rain shadows existed all over the place in the Rockies. Amazing! I arrived in Silverthorne late in the afternoon, and spent the rest of the day relaxing at the pool and shopping for a case of water at the local market. I had an early night, since the altitude was still bothering me a bit. Day 5: Will wonders never cease! I actually got up at Colorado time this morning. I must be adjusting finally to local conditions. Took long enough! 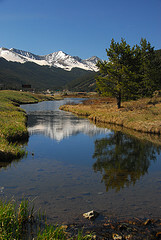 After breakfast, I drove through Breckenridge and headed up to Leadville. What a place. Surrounded by white-capped mountains. Full of slag heaps from old silver mines. Run down houses in the town, but fancy cabins the closer you got to Turquoise Lake. I stopped at the Visitors Center to get a map of the town, and they gave me a Walking Tour guide, which allowed me to photograph a building associated with the infamous Doc Holliday. Then I went up to the Matchless Mine to see the cabin where Baby Doe Tabor spent her last days after her Silver King husband died and left her and her children destitute. What a sad story. I took a few minutes to talk to the tour guide about what life was like in Leadville. 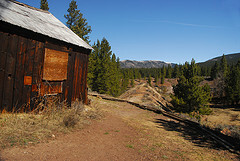 Apparently, the whole area is a criss-cross of old mining claims, and folks have built their houses over old shafts. One fellow she knew had his kitchen collapse into a shaft while he was in the dining room drinking his morning coffee. (Good thing he wasn’t in the kitchen!) Apparently, he was more upset about spilling his coffee than about his kitchen! That’s life in Leadville! I had a quick tour of the National Mining Museum before heading to Route 82 and Independence Pass. Oh my word! The road switchbacked up and up and up with no guard rails. Of course, I ended up behind a person driving a trailer, so we went even slower than normal. But as the drops increased in height and white-knuckled terror overtook me, I was glad we were creeping along. Toward the top of the mountain, the snow changed to a strange reddish color in places. I later learned a dust storm from Arizona came pouring in huge clouds over this section of Colorado, staining the snow on many of the taller peaks. In some places, the mountains were covered with blood red snow! After reaching the peak, I crawled my way downward with agonizing slowness. For some reason, the white-knuckled drops didn’t bother me so much on the far side of the mountain, though I wish they’d put up guardrails! 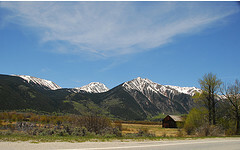 Then I was driving through Aspen and heading to Glenwood Springs and the Spa of the Rockies. 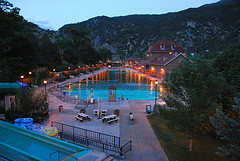 Glenwood Springs is famous for its hot spring pools – the largest in the world. And boy was it wonderful. 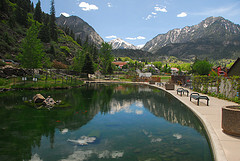 A massage and a long soak in the hot springs did much to cure my altitude problems. I slept like a log! Day 6: Finally! Back to normal. My body has finally adjusted to both the time change and the altitude, and I didn’t get up until 9:30 Colorado time, which is unheard of for me! Still, this is my vacation!! After breakfast, I headed up to the Glenwood Adventure Park and the Fairy Caves. On the tram ride, I met a nice couple from Fort Collins as well as one of the park workers. She suggested we try a ride called the Swing Shot. I’d heard about the Swing Shot, which took you right over the edge of the mountain. Didn’t sound like fun to me, but my new friends – Tory and Will – were keen to try it, so I went along for the ride. My mistake! It really did swing you right over the edge of the mountain. There’s nothing quite like being tossed over the edge of a cliff, swung out until gravity slams your body into the safety bar, and gazing down a thousand feet at the floor of the valley. Oh, and did I mention there were no proper hand holds? I didn’t even have anything to grip as I stared down at probable death. I was too scared to scream. About halfway through the ride, Tory shouted: “How are you doing back there?” And I couldn’t even answer her because my heart was in my throat. I staggered off the ride – which really was quite short - and went right to the food stand to get some water to calm my shakes. Never again, I vowed. We spent the next few minutes watching Will on the Bull ride, which he managed quite well without getting tossed. Then we all went together on the 90 minute cave tour. The upper cave wasn’t much to look at, but once we got to the lower cave, the formations were quite lovely. The lower part of the cave was obviously much more active and less subjected to the dry conditions which kept the upper cave from “growing” too well. I parted company with my new friends after the cave tour, and went down to Glenwood Springs for lunch and a quick hike up to Doc Holliday’s grave. Then I visited the Vapor Caves, which were a natural phenomenon that created a massive steam room underground due to the nearby hot springs. The “cool room” had to be at least 104 degrees, and the inner caves were incredibly hot. Water from the hot springs had flooded the floor in many areas, and I was grateful that I was wearing my flip-flops so that the water didn’t burn my feet. It was dim and rocky in the caves, with only a few marble benches lining the walls in each room. Apparently the Ute Indians used the vapor caves in the past – probably for sacred and medicinal purposes. I didn’t stay to long in the caves. The heat was overwhelming, so I nipped in and out for about an hour before calling it quits and heading down to the hot spring pools – which were next door. I spent two more hours soaking up the minerals in the pools before going out for Italian food. After all that steaming and taking the waters, I expect to be healthy for the next year!! Day 7: It was raining in the morning when I headed out to breakfast in Glenwood Springs, but it cleared up quickly as I made my way west toward Grand Junction. I stopped for a quick photo shoot at Palisades, just outside town, where the famed vineyards are framed by the massive stone mesa-palisade for which the town was named. I was amazed by the plethora of roses in Palisades and in Grand Junction. Lovely. 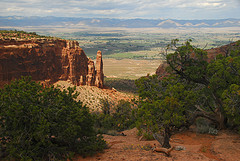 After a quick stop at the visitor’s center, I headed out to the Colorado National Monument. Wow! What a place. 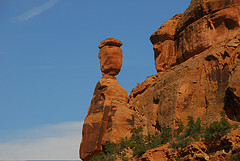 Free standing stone monoliths of red and gold stone, massive canyons, amazing rock formations! I spent about 4 hours hiking the paths, driving the rim, and watching wildlife. Lizards galore! And once a humming bird spent a good five minutes examining a bush right beside me before he flew away. I oohed and ahhed my way along the road, stopping at every overlook and hiking trail. The monument wasn’t busy, so I had plenty of space to park where I liked and could frame every shot without jockeying for position with other photographers. This was the high desert, and the heat was intense. Thank goodness for hats and sunglasses, not to mention the case of water I’d stowed in the car. 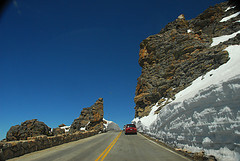 I drove from south to north on the rim road, and the scenery got more and more spectacular as I progressed. I wasn’t too thrilled by the steep drop offs along the road and some of the hiking trails, but the view was worth it. On one memorable stop, the reddish dirt path out to the rim was thin, narrow, and steep. I gulped a breath and went for it, sliding down part of the way before I gained good purchase, and sighing in relief when I reached the promontory, which was broad and wide and filled with flowers and small trees, stone outcroppings and cacti. I wound my way through this wonderland, moving ever toward the edges to gawk at the monoliths standing tall and proud out of a massive canyon. A gap through one of them showed the plateau below in greens, grays, blues and browns muted by distance. I climbed all around the edges of the promontory, wanting shots from every possible angle. Reluctantly, I tore myself away, realizing that the government would probably not let me build a cabin there. But what a view! Finally, exhausted by heat and exercise, my car snaked its way down from the monument and I staggered into my hotel for room service and an early night. Day 9: After two days of strenuous hiking in high heat, I decided to take it slow today. I got up late, had breakfast and meandered my way from Montrose to Ourey, where I stopped to take a dip in the hot spring pools they have in the center of this tiny, exquisite box canyon. Since the national park service probably won’t let me build a cabin in the Colorado National Monument, I think I’ll settle here! The picturesque downtown was right out of a Wild West film, and the surrounding mountains were lovely beyond description, rising in green splendor toward a blue sky, with snow still frosting their tips. Reluctantly, I left the hot springs and lovely town and drove over the pass and down into Silverton. My timing was perfect. With 20 minutes to spare, I could just make it to the Old Hundred Mine for a tour. I drove through town, a small place of the sort that once put the Wild into the Wild West, and went out onto the dusty back roads, through a ghost town and then up and up a steep dirt and gravel road to the mine. Whew! A couple of times I thought I’d rattle right off the dirt road and down into the raging stream winding its way through the valley below. 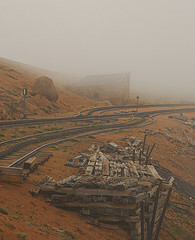 But I managed the journey without mishap, and parked right beside the mine. A few minutes later, I was in hard hat and oversize yellow raincoat, stepping into the small mine-train which would take us into the mountain with a nice couple sharing my seat and a family with 2 small sons sharing the other. An experienced miner took us into the mountain, where water showered down on us inside the entrance and didn’t stop dripping into we got to the lighted area deep inside. A stream flowed down one side of the tunnel in which we descended from the train. Our guide got out with us and soon had us trying out the pickaxe, peering into mine shafts, watching demonstrations of the heavy equipment, and telling us tales of Tommy knockers. At the end of the tour, he beamed his light into a crevice overhead and there were three carvings of Tommyknockers, put there by the miners to appear the little elves who like to throw stones, steal tools, and eat the miners food when they weren’t looking. A Tommyknocker who liked a miner might also knock in warning on the walls or ceiling of a shaft to tell the miner to get out quick before it caved in. 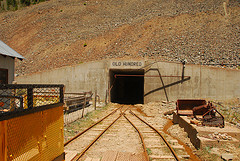 After exiting the mine on the train – again through a shower of water – the whole group took turns panning for gold and silver. I got me a silver nugget and some flakes of gold. Not bad for a greenhorn! 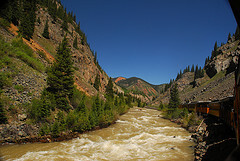 The trip from Silverton to Durango took me over two scenic passes, and then down into the valley. Lovely scenery, with the red rock peeping out through the evergreens in some places, and sprawling ranches on either side of the highway. After supper, I took a drive around town and up to the college on the ridge to look down on Durango. Lovely! 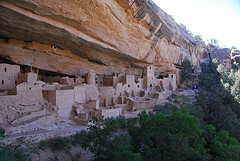 Day 10: I was up early today heading out to Mesa Verde while it was still cool. The drive took about 40 minutes, and I spotted the huge blocky outcropping at the head of the mesa as I came through Mancos, and I paused to take photos of it after entering the National Park. The trip up the Mesa to the visitor center takes nearly 30 minutes, winding up and up into the highland, which has small valleys, dips and curves of its own. The view was magnificent, and I stopped several times for photos. There were also places where fire had burnt the trees, which stood tall and dead among the green bushes, young trees and flowers at their feet. At the visitor center, I bought tickets for both Cliff Palace and Balcony House tours. Cliff Palace was a magnificent pueblo built into the cliff face about halfway up. It had several towers and 23 kivas, and no matter which way you looked at it, it was amazing. Our guide led us down a steep staircase cut into the stone between two huge boulders. Then we followed a paved path to a wooden ladder, which led us up into the hollow in the cliff where the pueblo was built. We sat in the hollow while the guide told us about the pueblo builders, gazing across at the Cliff Palace, which reared above us. Then we went up to the ruins, gawking in amazement and taking photographers. The guide led us to one of the kivas – which are deep, circular rooms that are used for spiritual purposes by the pueblo ancestors, and are still used today by tribes like the Hopi. 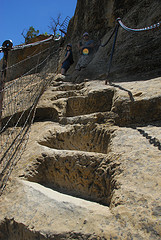 Our way out of the cliff palace lay in a crack in the cliff with more carved stone steps and three ladders. 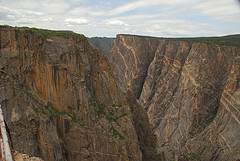 I was invigorated by the climb and by my talk with a lovely Navajo couple who were on the tour with me. In discussing the pueblo religion and the kivas, the woman had told me a little of the Navajo beliefs, including their deeply held belief that they are to “walk in beauty:” I liked that philosophy of life. My journey next took me to Balcony House, which was a strenuous hike although not long. Many people over the years that the park has been open have turned back when they see the first 32 foot ladder up the cliff face into the house. I was not one of them, though I was thankful that the man climbing the ladder beside me gave me lots of encouragement. Once my feet were on solid balcony, I felt a lot better about the climb and started taking pictures as the guide explained some of the mysteries of Balcony house: a walled-off door, the only entry way a small crawl tunnel created by blocking in the entry way with rock, with only a small peephole at the top where a warrior could guard the entrance. The evidence seems to suggest that this particular group may have had enemies. The two sides of balcony house were different: One had a retaining wall with a filled-in floor and only one small entrance, well concealed. A place to keep women and children safe during a fight, perhaps? The other side had no retaining wall – no wall at all on the outside. Just a nice sheer drop of a thousand feet or so if you got to close to the edge. I stayed by the inner wall!! 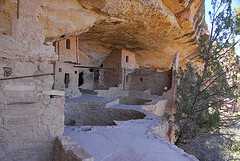 There were two kivas in the second side, probably used by two family groups living in Balcony House. To exit, I had to crawl through the tunnel, climb a ladder up to a sheer cliff face with steps awkwardly carved into it (and two chained fences to keep you from falling off the cliff face, for which I was truly grateful, not being a rock climber.) At the top of the cliff was one last ladder, with nothing between it and the very deep valley should you slip and fall backward. I did not slip, but I was shaking mightily by the time I reached the top and safety. Whew! After a quick lunch and a stroll through the museum, I drove around Mesa Top Loop and stopped to see the pithouses, pueblos and other ruins, including a half-finished sun-temple they believe was started by the pueblo people when the drought which eventually drove them from their cliff-homes became bad. They speculate that the temple was meant to appease the spirits causing the drought, but they had to abandon the work before it was finished. As I headed out of the park, I stopped at a scenic overlook – the highest point in the Mesa, and gazed and gazed out at the surrounding mountains and mesas. Astonishing! My parents had arrived in Durango while I was at the Mesa, and we headed out to dinner at the Palace restaurant beside the Durango and Silverton Railroad station. Unfortunately, during dessert my Mom was struck down with altitude sickness that triggered her heart condition, so the day ended at the emergency room, with Mom being admitted to hospital. Day 11: Not much to say about today. Mom was in ICU, recovering nicely but under observation. I took Dad up to Mesa Verde during the afternoon while she was being tested for everything under the sun, and we walked down to the Spruce Tree House which was in the cliff behind the museum. Mom is being released tomorrow morning, but she will need to be on oxygen for the duration of the trip. Great doctors, nice hospital, good nurses. Still a stressful experience. Day 12: Today was spent at the hospital getting Mom ready to leave, at Walmart picking up prescriptions and supplies, and at the hotel arranging oxygen delivery for Mom. By evening, I was ready for an early night. Dad and I ate at Dennys and brought dinner back for Mom. I think we were all asleep before 8 pm. Day 13: Today was Mom’s first real outing of the trip. 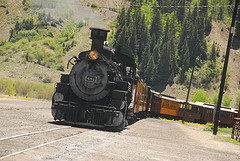 We took the old scenic coal train from Durango up to Silverton. Folks everywhere waved when they saw the train, and I spent a blissful three hours shooting photos of the spectacular scenery as we climbed the mountains beside the Animas River. The trains jounced and jolted us until we were most glad to reach Silverton. We ate at the Shady Lady, once a brothel and now a nice restaurant. Then I explored the town while Mom sat on the porch and shopped for jewelry, one of her favorite things to do. I found a smashing ice-cream shop in an old building with a fancy poured tin ceiling. I also spent several minutes conversing with a funny old crow sitting in a tree beside one of the old buildings at the edge of town. He was cawing and making funny rik-tiking sounds as if he was talking right back to me. I loved it. I hurried back to the center of town when the train pulled back in to take more photos and watch a gunfighter sweet talking the ladies into taking pictures with him for cash. I did not allow myself to be sweet talked! Instead, I collected the parents and we took a bus tour over the mountain passes and back down to Durango. Mom and Dad had a rest then while I went up the road to the local hot springs resort and spa and soaked in the mineral springs and swam in the outdoor Olympic sized pool (also mineral spring fed.) The air was warm, the sun was shining, the pools were in a lovely garden setting with a riot of flowers edging the lawn. Perfection! For dinner that night, we ate Texas barbecue at a little place called Serious Texas B-B-Q that was almost next door to our hotel. It was obviously a popular local hang-out, and we ate until we could fit no more in. Good choice, Dad! 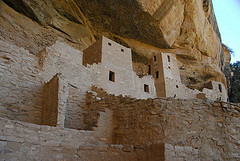 Day 14: Today we took Mom up to Mesa Verde to see the pueblo cliff houses, something she has always wanted to see. 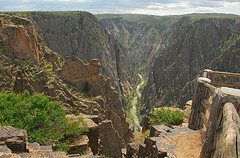 Then we drove over Wolf Creek pass and along the Rio Grande to Alamosa. I spent a delightful hour hiking and shooting pictures at the pass, but otherwise this was mostly a travel day for me. Sunset over Alamosa that night was amazing: A blazing ball of golden flame light the sky and went down into the prairie grass like the sun disappears into the sea. Day 15: The Great Sand Dunes brought me to Alamosa, and I was not disappointed. 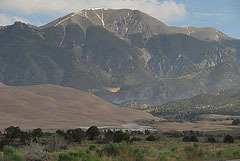 The dunes at the edge of the San Cristo mountains were the largest in the USA, and they were gorgeous, framed as they were by the mountains in the back and Medano creek in the front. I got all sandy running around with my camera, and then we went four-wheeling down a rough trail to the “point of no return.” We saw a lot of deer wandering the grassland beside the dunes. Next, we drove up to Salida for lunch while we listened to Louis L’Amour’s the Skyliners, a book about Alamosa, the San Cristo mountains, and cowboys! It was fun to be listening to the story while we drove through the region where it took place. Our next stop was the Royal Gorge, where we took the trolley over the suspension bridge, saw a white buffalo in the wildlife park, and then took the incline train down to the bottom of the gorge. The Arkansas river plunged by, still very high from the melt waters from the mountains. I gazed up and up at the tiny bridge and marveled at the sight. But we had no time to linger. Our last destination was the Flying W ranch for dinner and cowboy music. So it was off to Colorado Springs at our dinner reservations. 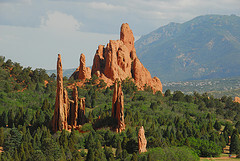 The Flying W ranch was right next door to the Garden of the Gods. So once we got Mom settled down at her table, I climbed up the cathedral rock to the overlook, and then came back down to watch a demonstration of Native American dancing before having a chuckwagon dinner family style. After dinner, there was music, some sweet, some hilariously funny. The interplay between the cowboys was delightful, and my favorite moment was when one of the guitar players came out in a squirrel suit and sang about the day the Buffalo squirrel got into the church. The songs I liked best were Ghost Riders in the Sky and Rolling, rolling, rolling. Day 16: Today, Dad and I went up Pikes Peak on the cog-rail train in the morning. The clouds were down along the mountain top, and by the time we were halfway up, mist was rising around us. We saw pikas and marmots, and tundra flowers. At the top, we saw cloud and more cloud. Cracked me up! One of the most famous views in the world and all I saw of it was cloud. But that was okay. When we hit 14 thousand feet, I started feeling lightheaded, so I took it easy, just stopping long enough to get some of the famous donuts and have my picture taken with the sign before sitting down in the train with my Dad, who was also feeling the altitude. The dizziness disappeared within 500 feet of the top, thank goodness, and I enjoyed the ride down, taking dramatic photos of the clouds reaching down to touch the ground. We picked up Mom at the hotel and drove out to the Garden of the Gods in the afternoon. A thunderstorm rolled in as we took the bus tour through the Garden, and so we drove in the rain to the trading post, where Mom and I did some shopping while the rain came down around us. Then we parked the car near the central garden and I hiked through the fabulous red rock formations, the original rocky mountains before the young upstarts we have today rose up, listening to the cliff sparrows singing, watching the pigeons flying around the three sisters formation, and taking pictures until I was driven out by another thunderstorm. We had a nice steak dinner across the street from the hotel, and then found that Mom and Dad’s door lock had a mechanical malfunction! After much manipulation, the hotel managed to get the door open and moved them into a nice suit next door, free of charge. It was a rather dramatic end to the day! Day 17: Our last full day in Colorado started with a drive up to the town of Florissant in the rain. I had heard they had fossil beds there, and I was not disappointed. I arrived in time for the 10 am lecture, and the outdoor amphitheater had four huge fossilized redwood tree stumps – each as big as a boulder! The rain poured down outside the ampitheater as we learned about the ancient volcano lahars which flowed over the redwood forest, fossilizing the lower trunks, killing off the upper as they burned in the heat of the mudflows. The volcanos also laid down ash layers which fossilized many plants and animals and insects, including complete flower fossils and butterflies. Amazing. 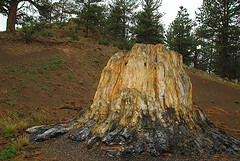 When the rain let up, I wandered the hiking trails, stopping to look at each redwood stump that they had left visible. Many were buried to prevent further eroson by the elements, but enough were still there to satisfy. A thunderstorm drove me back to the car, where I met my folks – who had opted to stay in the museum to see the film rather than brave the elements. Next, we drove down the road to Cripple Creek, and right into a cloud bank. I know we entered a town because the sign said so, but all I glimpsed through the swirling mist were a few edges that looked like they might belong to buildings. In desperation, I stopped at a sign saying “information center” and begged the lady sitting in the converted railway car for a restaurant recommendation. She sent us to Maggie’s, just two blocks away, which was all I wanted to travel in the mist and driving rain. I dropped Mom and her oxygen tanks at the door and had to circle the block twice to find parking. Finally parallel parked by a white-line zone which I fervently hoped meant it was okay to park there and ran through the heavy mist and rain down a very long block, around the corner and into the restaurant. Once seated, I ordered the best hamburger I have ever had, and watched in amazement out the window as the pea soup of a fog slowly lifted, with sun and blue sky peaking through momentarily and then turning to an iron gray sky with no trace of fog. I was astonished to see a large brick building appear across the street from us. I had no idea it was there! When we finished eating, I ran to get the car and bring it around so Mom didn’t have to walk to far with her oxygen tank, and I kept pausing to gaze about in wonder at the Wild West town that had appeared out of the mist, with brick and false front buildings, casinos, a scenic train, and the familiar high-desert landscape of a tall mountain. Wow! Now that the weather had cleared, we drove up to the Mollie Kathleen mine and took a tour with a very knowledgeable guide. It was without doubt the best mine tour I’d ever taken. We descended 1000 feet in a mine elevator that was the size of a very small phone booth – with 7 of us crammed into the cage. The descent was so fast I thought at first we were free falling. It was in total darkness too, except for the light in our guide’s hand, one story below us in the lower section of the mine elevator. Three times, a lighted mine shaft appeared and disappeared in a flash as we traveled by. Then the elevator slowed, and stopped at the fourth shaft. We got out and followed our guide along the rail tracks laid on the floor through several hard rock tunnels. He demonstrated mining from its beginnings with hand-held, manual tools and dynamite, to the mule-run mine carts and then on to the more sophisticated electric-run tools – huge machines to drill holes for blasting, which grew more complex but easier to use as time went on. He even told us how the gold veins were mined up, so the rock could be dropped down into the lower shaft and taken out that way, much easier than having to pull it up. Next he took us on a ride on an air-pressure run train that replaced the mules over time, and showed us the bicycle-like vehicle used by mine-bosses to peddle along from place to place on the track. It was a nice, loud vehicle that warned the miners that the boss was on the way, long before they could see him! He also showed us the gold veins running through the stone. They were purple with silver flecks in them! The silver flecks were the gold, which didn’t turn gold color until heated to 1800 degrees. Cripple Creek is one of the few places in the world where gold works this way. The veins were consistent, so they could follow a vein from the top of the mountain downward and know where to find it again when they drove a tunnel down several hundred feet below the previous one. At the end of the tour, he showed us a little exhibit which document the mines in the area, including the story of the finding of the Mollie Kathleen, which was – you guessed it – found by Mollie Kathleen. He also told us about one mine in the area that found a gigantic underground geode full of gold all over the faceted walls. The men sent in to mine it had to strip down to their skivvies before they were allowed inside and a huge metal door was put over the entrance and kept locked! 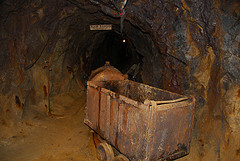 There was one mine in the area that found more than a million dollars of gold in a single mine-cart. The Cripple Creek area produced more gold in a single year than the entire California gold rush, and most of the gold is still in the ground. Apparently, it is the second riches strike in the world – the first being in South Africa, where it is much cheaper to mine than in the USA. Still, the Mollie Kathleen is mined for gold to this day, mostly during the winter months when it is warmer to be underground! We left the Cripple Creek area with reluctance after our tour, and drove up to our airport hotel in Denver to drop off the rental car and make arrangements for our flight home on the morrow. Goodbye for now, Colorado. I will be back soon.